Adobe Walls Texas, Battles of Adobe Walls. 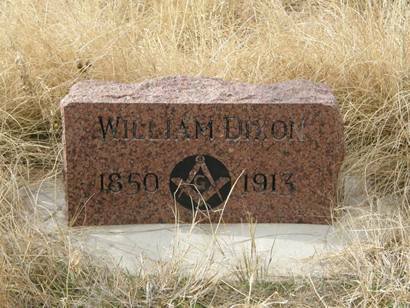 located in a Road Side Park 6 miles north of Borger. 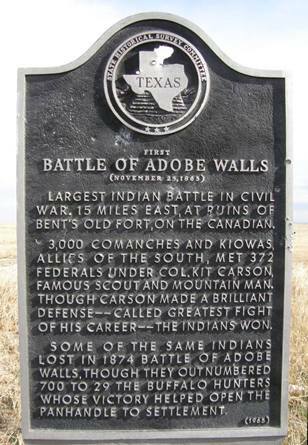 The name Adobe Walls has been applied to several trading posts north of the Canadian River. The earliest date is given as 1843 and the first structure appeared around 1845-46 when an 80 foot square adobe structure was built and aptly called Fort Adobe. Indian misbehavior forced the post to close by 1848. 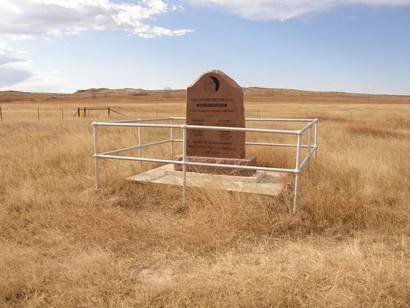 Attempts were made to reestablish the post, but it was finally blown up in frustration, providing the Panhandle with its first landmark ruins. 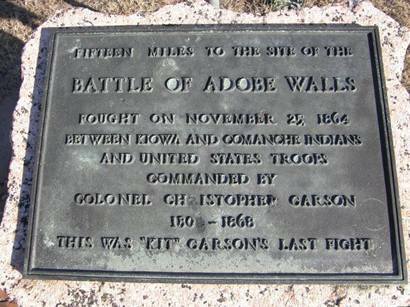 In 1864 the First Battle of Adobe Walls was fought when Colonel �Kit� Carson and his force of 335 men (with 75 Indian allies) fought hostile Kiowas, with assorted Apaches, Comanches, and Arapahoes near the ruins. The casualties were three dead with 15 wounded for the Army and Indian casualties were estimated to be 60 killed or wounded. Ten years later, Dodge City, Kansas merchants opened a trading post/ restaurant/ saloon a mile from the original ruins. 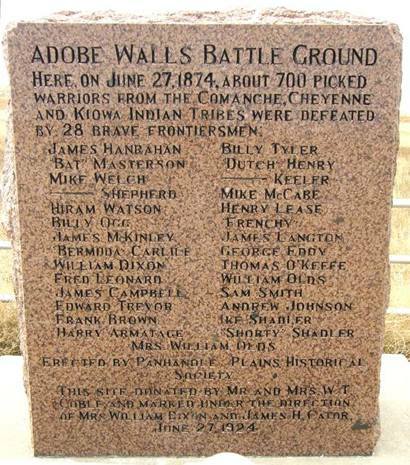 Trade with the area�s buffalo hunters flourished until June 1874 when the Second Battle of Adobe Walls took place. 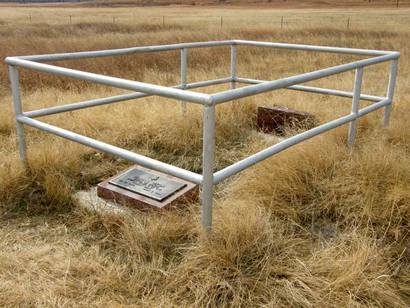 The main building was constructed of sod - in the fashion of Kansas buildings - and although the complex was overwhelmed by a force estimated between 300 to over a thousand Indians, the defenders held their own with only three dead (one an accident after the fight was over). The post was abandoned. Later the Turkey Track Ranch made its headquarters near the original site. 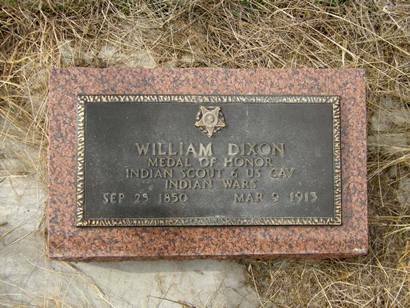 Former Army scout and survivor of the 1874 fight, Billy Dixon built a house at the ruins of Fort Adobe. In 1887 Dixon�s house became the community post office and Dixon became postmaster. Adobe Walls as touted as an up and coming settlement in an attempt to recruit settlers, but in truth it never truly developed. The population never exceeded 20 throughout the 20th Century. Largest Indian battle in Civil War. 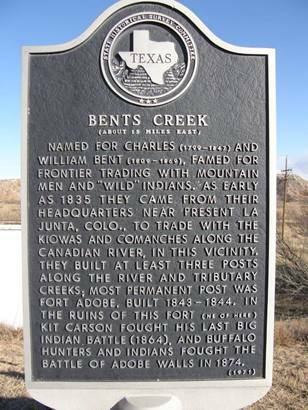 15 miles east, at ruins of Bent's Old Fort, on the Canadian. 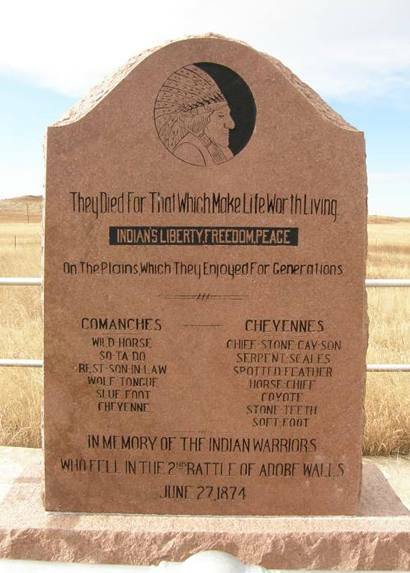 3,000 Comanches and Kiowas, allies of the South, met 372 Federals under Colonel Kit Carson, famous scout and mountain man. Though Carson made a brilliant defense - called greatest fight of his career - the Indian won. 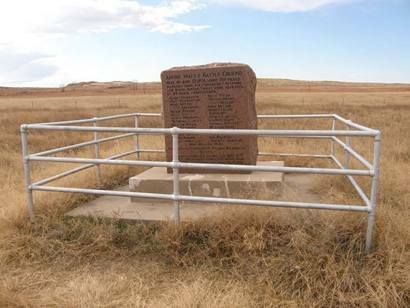 Some of the same Indians lost in 1874 Battle of Adobe Walls, though they outnumbered 700 to 29 the buffalo hunters whose victory helped open the Panhandle to settlement. Maybe I know because I am part Caddo. but, when I visited the location in 1966 with my dad, he told me this. Due to the distance from the mounds that the bullet traveled and found it's high ground mark to the North, that one Chief stated: "Shoot today, Kill tomorrow." The Panhandle-Plains Historical Society acquired six-acres of the 1874 site in 1923 and archeological digs have turned up a trove of artifacts. 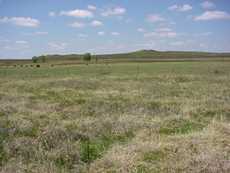 The site is on the National Register and is Texas state archeological landmark. 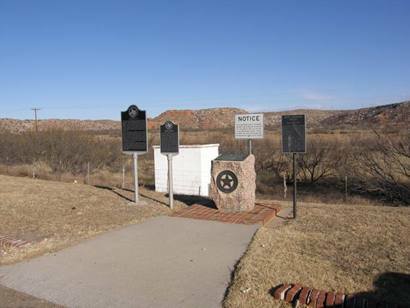 History states on June 27, 1874, at daylight, a large force of Indians under the command of Quanah Parker attacked the Buffalo Hide hunting camp of Adobe Walls, located northeast of Borger just north of the Canadian River. 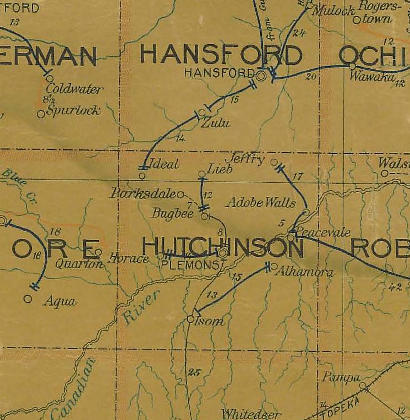 Reams of information have been written about the famous battle, recovered artifacts fill numerous displays in museums, and the battle participants have been awarded honors and made famous for their efforts during this famous episode in Panhandle history. History also leaves the impression the site seemed to die after the Indians returned and burned it to the ground. This is not true. Adobe walls do not burn, only the wooden portions of the roof and partitions inside were destroyed. In fact, according to Cleon Roberts, historian and writer from Hereford, in his article published in a book titled "The Encyclopedia of Buffalo Hunters and Skinners," Adobe Walls lived and thrived for about seven more years after the Indians supposedly left it in ashes. It seems a stockade (standing adobe walls) was used as a store run by A.G. Springer in 1875, a year later. James H. Cator, a famous buffalo hunter and resident living at the nearby Zulu Stockade, visited the site many times for supplies. 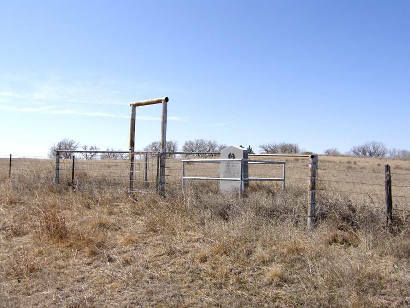 With buffalo hunters, ranchers, cowboys, mustang hunters and others visiting for some seven years after the Indian battle, there is no doubt Adobe Walls had an interesting and continuing history and afterlife. "Sometimes history remembers the marksman and other times it's the victim whose name attaches itself to historical immortality. The deciding factor is who writes the history, and the history of the Old West was not written by the Indians.